So how do we lift our card effects out of the realm of the juggler into the world of magic and mystery? 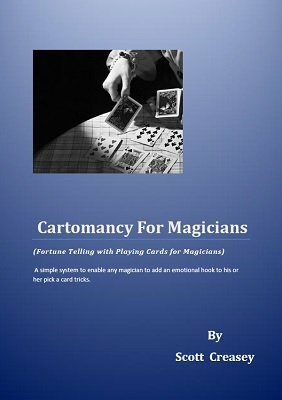 Answer, Cartomancy for Magicians , a simple system to enable the magician to add an emotional hook to his or her pick a card tricks. Cartomancy is fortune-telling or divination using a deck of cards and appeared soon after playing cards were invented; in fact many historians have suggested that playing cards may have originated as a fortune telling tool long before they were first introduced into Europe in the 14th century. The system is one of the oldest of the more common forms of fortune-telling and was the most popular form of providing fortune-telling card readings in the 18th, 19th and 20th centuries. Injecting just a touch of fortune telling with cards into almost any card routine you perform will transform the way your standard card effects are perceived by audiences. This system which is a blend of basic Numerology and Tarot is one I developed for my own use many years ago and still use today. Because the system is simple and based on a few key words, you don't need to memorise long complicated interpretation's and can give a quick definition of any cards that are chosen or thought of in your pick a card routines. The ebook starts with a condensed history of playing cards and Cartomancy before moving on to the basic system. Also included are examples of how to add a touch of fortune telling with cards to standard effects like the ambitious card, how to expand the readings when asked, the advantage of using marked or stacked decks and finally how to give group readings at the close up table. Welcome to Cartomancy for Magicians . 1st edition 2016, 22 pages.